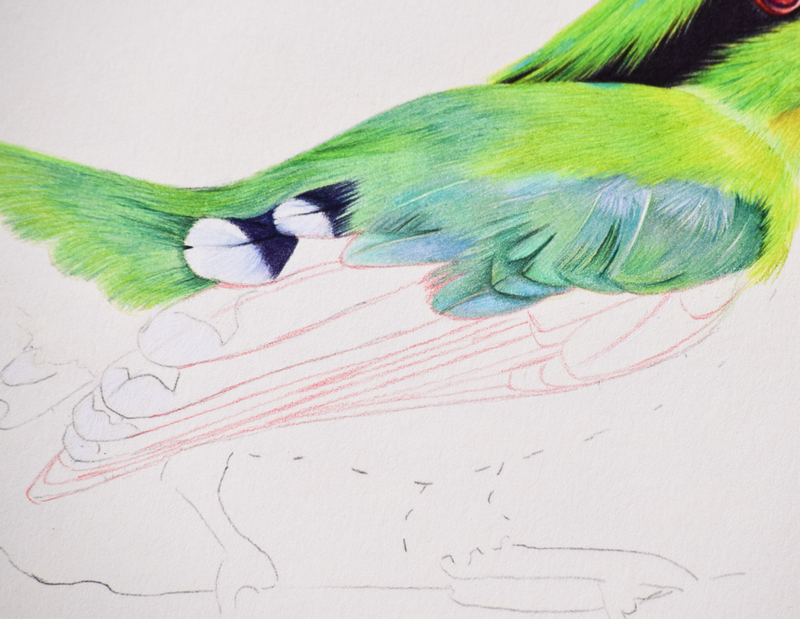 These are the steps l used to create the wing feathers on the Green Magpie that l drew. ln step 1 the only thing l have done is draw in the feather shapes in the lightest shade l am using for these feathers, which is Caran D’ache Pablo’s in Raspberry Red. (I used the lightest shade because l am drawing freehand with no guide and want to be able to cover any mistakes, if your outline is already drawn start with a darker shade but don’t use too heavy pressure). I have also blocked out the areas of the feather to be left white with Caran D’ache Luminance white, l have blocked them out using strokes in the direction of the feather using a heavy pressure which almost indents the lines. ​l also mark in heavily with Luminance white a couple of white veins that l want to show later. Step 2 shows the first layers of color going in. 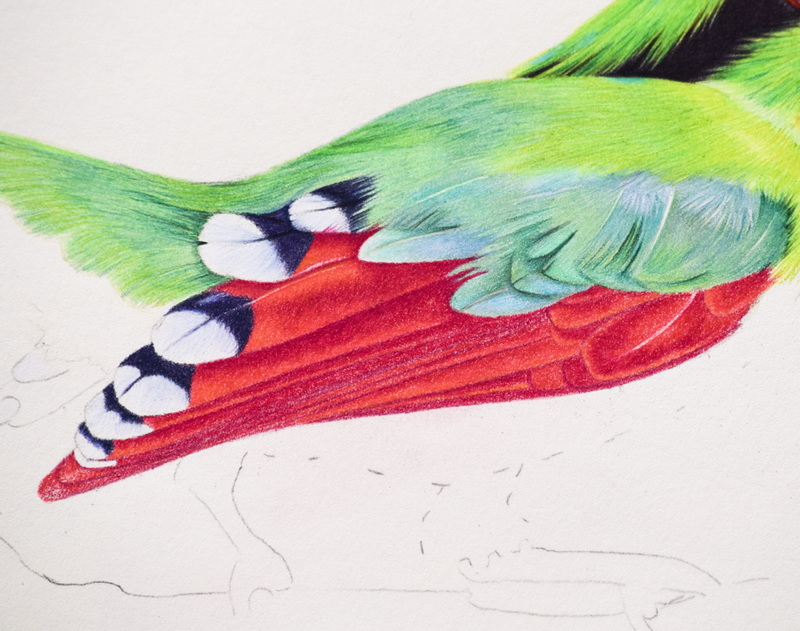 The first thing l did was go over my outlines with a darker shade, Pablo’s Carmine, then l picked out the lighter areas around the edges of the feathers with Pablo’s Raspberry Red filling in the main body of the feather with Pablo’s Ruby Red. Although it is hard to see on this photo l worked my pencil strokes to match the direction of the individual strands of the feather. Even though with these feathers the individual strands are not visible on the finished feather, working them as if they were going to be does make the finished feathers look better than if you didn’t. I can’t explain this, other than that although your eye can’t consciously pick this up there must be something in the way the colors blend that help it to look ‘right’. Then looking at my photo l can see certain small areas (mostly along the edges, but also a few patches) where the feather really catches the light, l have added a layer of Faber Castell Polychromos Dark Cadmium Yellow to these parts, when l work over with more layers these should appear to be catching the light. Step 3 is where everything starts to blend together. 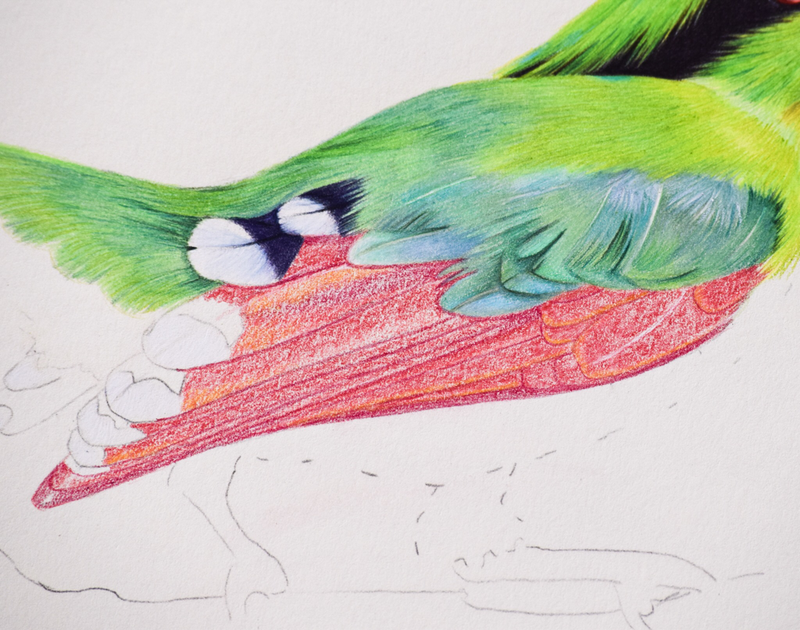 Using the same colors as in Step 2 l begin to fill the tooth of the paper so no more white dots show through, and to start to pay more attention to the darker and lighter areas on each individual feather. I add Holbein Carnation over the areas where l had layered the yellow previously, now they no longer look yellow but you can start to see that they appear to have light on them. 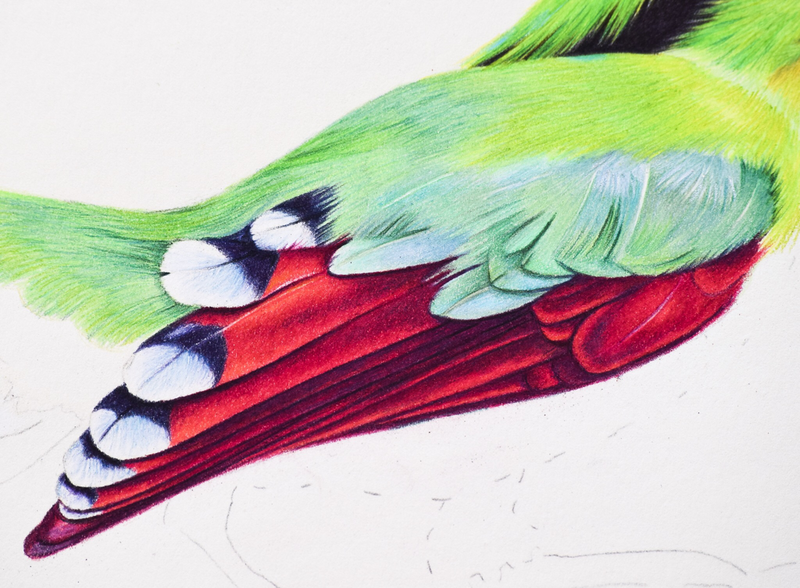 I use Faber Castell Polychromos in Magenta to start bringing in some shadow and darker areas on the body of the feathers. l also begin on the ‘black’ parts of the feathers, using Pablo’s Indigo Blue and Polychromos Dark Indigo Blue to create a base layer. I add a little Prismacolor Skyblue Light to the white parts of the feathers to start to build a little depth and interest to them. ​You now have a fairly well saturated, but very flat looking wing. Step 4 is where l begin to build some definition and shape using contrast mainly to do it. To begin with l want to make the whole wing a slightly darker shade of red than it is, so l layer over the body of the feathers with Holbeins in Strawberry, Rose and Carmine. Then l really begin to build the shadows using Polychromos Red Violet and Magenta and Pablo’s Indigo Blue. Step 5 nearly there! 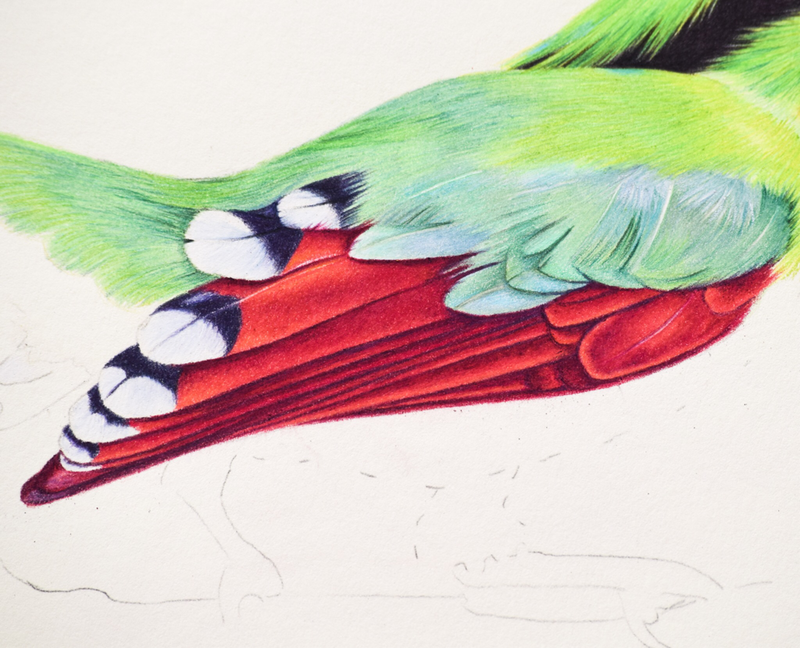 I start to define the feathers much more. Now putting in my darkest darks, Polychromos Dark Indigo and Black (very sparingly). The changes are subtle from the last photo, but if you compare you should see more depth in step 5. At this point l take a photo and really scrutinize how well this is working. I can see that l still need to create more shape and depth. ln the final step here l wanted to add a bit more depth and definition. I added a layer of Holbein Strawberry over the whole area. I wanted the red still darker in the shadowed areas, but not to start looking black, so l used Polychromos Phthalo Green. I then picked out a few of the very darkest areas again with black and Indigo. 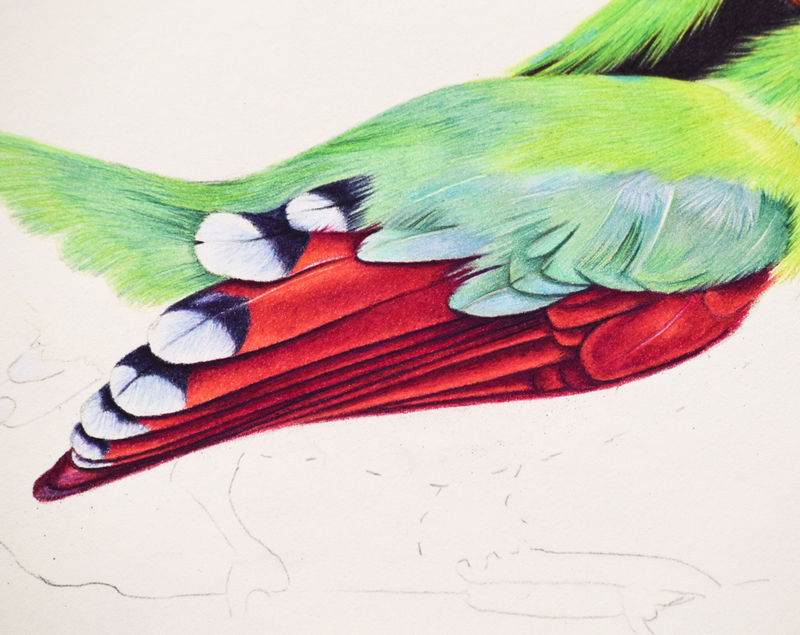 Finally l added a little Pablo’s Light Green and Holbein Sky Blue to the white areas of the feathers.